← No, I am NOT taking a washboard on vacation. Ever. 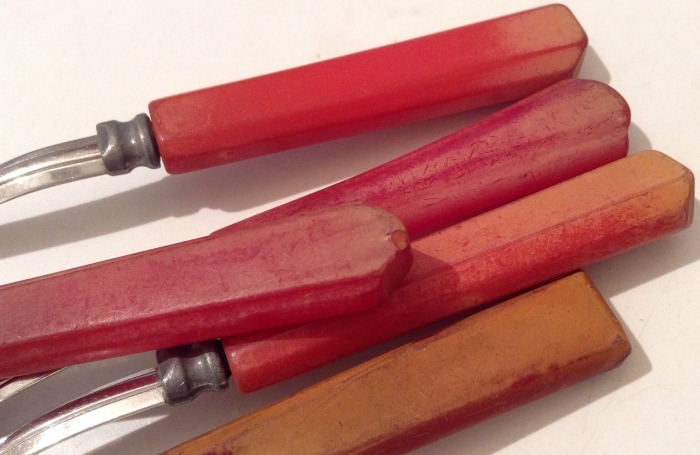 I’m still working on the best way to restore my Bakelite flatware. Here are four more cleaning solutions. 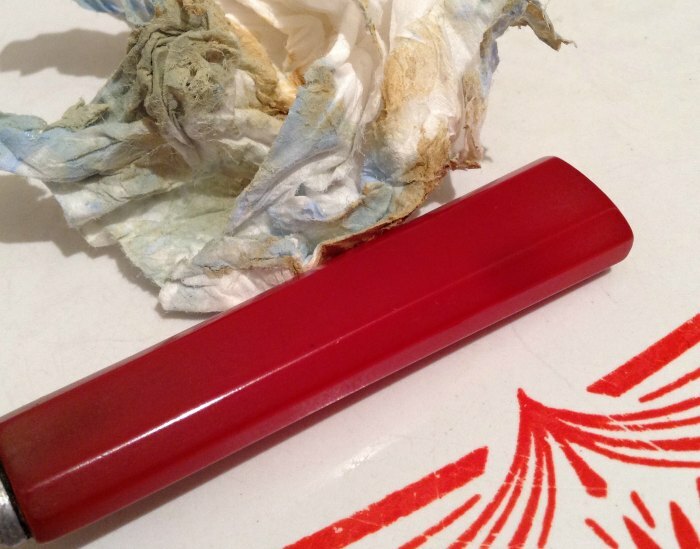 409 cleaning solution is mentioned frequently in connection with Bakelite, primarily as a way to “test” if it’s the real deal. What the heck, I decided to see if it would work. I’ll let the photo below serve as exhibit A.
Nope. It was completely ineffective in removing the oxidation. I don’t know how it could be used to “test” Bakelite. Any tell-tale scent of formaldehyde would be overwhelmed by the smell of 409 itself. In all fairness, it did a nice job of shining up my bathroom sink, but I was wishing for a gas mask. This is another “nope”. It releases a strong smell of formaldehyde when it’s rubbed on the Catalin/Bakelite. Initially it appears to polish off the oxidation, but as the piece dried the yellowish film reappeared in new places. It seems to initiate more oxidation. It stung my hands while I was using it. It did a terrific job on my stainless steel kitchen sink, but I’ll wear gloves when I use it again. And I won’t use it on my Catalin flatware. On to exhibit C: Blue Magic. ManRay picked this up for me at the auto parts store. He didn’t mind that errand one bit. So how’d it do? Blue Magic is marketed as a magic formula to restore plastic headlights. It did an amazing job shining up the spoon when used in great globs. It contains ammonia and truly stinks. A lot. I wouldn’t use it indoors again without super duper ventilation. Although it works, I’m not too keen on using it on eating utensils. Okay, on to exhibit D: toothpaste. ManRay says that some people use toothpaste to polish things, so I gave it a try. The verdict? Meh. 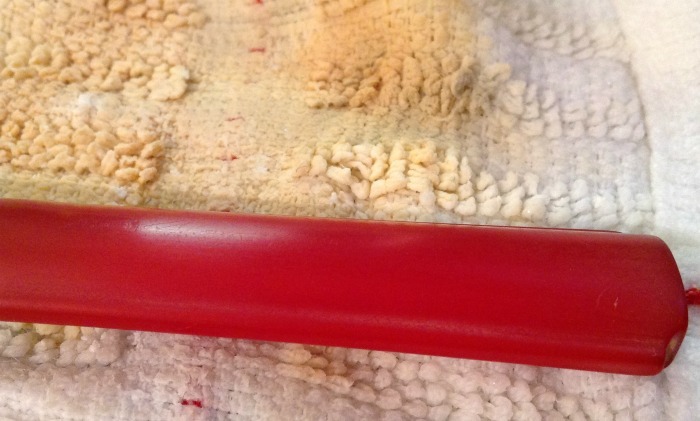 Toothpaste is a good polishing compound for teeth, but not very effective on Bakelite. The best I can say is it’s minty fresh and non toxic. I’ve got a couple more remedies for Part Three and more oxidized spoons to restore. 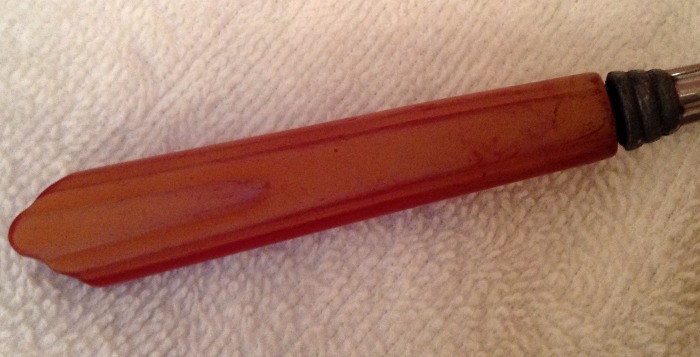 In the meantime, keep your Catalin/Bakelite out of hot water! And let me know if you’ve got a cleaning suggestion. What about GooGone? It’s an oily substance, isn’t it?